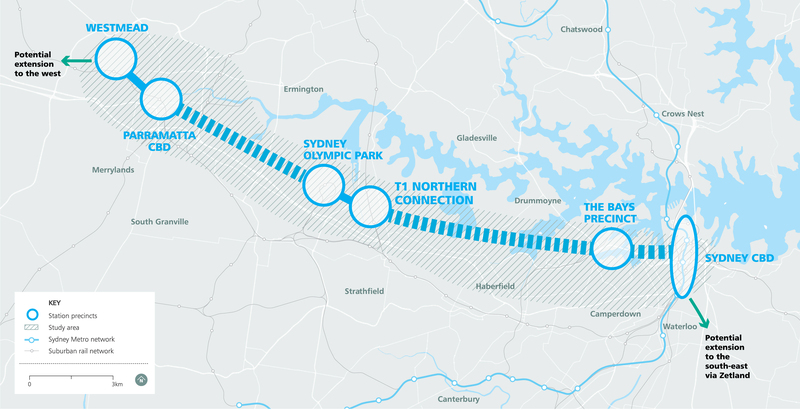 The Sydney Morning Herald reports on the latest update of the planning for the Sydney Metro West line, which will go from the Sydney CBD to Westmead, with stops in the Bays District and Parramatta and other locations (such as Pyrmont, Kings Bay, North Burwood or Five Dock, and Camellia or Rydalmere). None of those locations will be the University of Sydney main campus, despite the fact the University recently announced a new campus at Westmead, on the Metro line, which could eventually match the significance and size of the main campus in Camperdown and Darlington. The University of Sydney is a large and growing campus, the largest in Australia by some counts, serving about 50,000 students and expected to expand by half again as many over the next 20 years. As a point of comparison, the Parramatta CBD, Sydney’s second CBD, has only 47,000 jobs, and so perhaps fewer daily commuters than the university campus. Construction is already in process to serve up to 10,000 more students at the University. That expansion will reduce parking, and make it more difficult to drive to campus. Getting those students, and the staff who serve them, into and out of campus safely and efficiently is critical, and will get increasingly challenging as the transport capacity serving campus remains essentially fixed. The University of Sydney is served directly by numerous buses, and indirectly by several train stations. The most notable of these is Redfern Station, about 8 minutes walk south of the Darlington Campus, but a nearly 25 minute walk from the north end of campus. Central Station is 22 minutes from the north end of Campus and 19 minutes from the Engineering Precinct. Macdonaldtown is 19 minutes from the Engineering Precinct and 22 minutes to the north end of campus. These are not inconsiderable access costs, experienced each way each day by train users, in a region aiming for a 30-minute city. 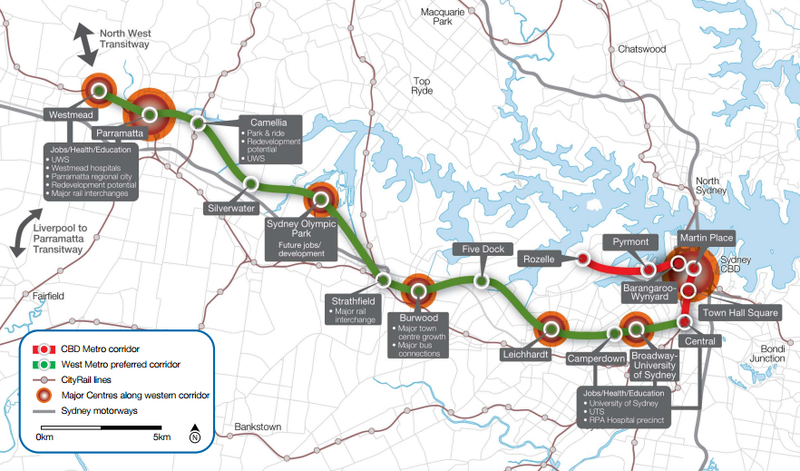 A new heavy rail line going west, but somehow missing the University of Sydney, the biggest market between the CBD and Parramatta, which is both growing on the main campus and due to interactions with the upcoming western campus at Westmead, is an opportunity that cannot be recovered from. Metro construction is about a once per century investment, and getting it right is essential, failure is irredeemable. The argument against is that the next target station, the Bays District is farther north is true, so a line that picked up both the University and the Bays District would be circuitous, and thus slower for everyone on-board. There is a classic tradeoff between station number and ridership, lowered access times for higher in-vehicle times. So perhaps the same line shouldn’t pick up both stations, at least not in sequence. The Sydney West line could instead serve Central and the stations west of the Bays District, and Pyrmont and the Bays District dealt with separately. One alternative would be to run a separate line to the Bays District, Pyrmont, Barangaroo, and downtown, and on to Zetland. While the Bays district (White Bay Power Station) has development potential, it remains speculative. Google for instance has passed on the site for its Australian headquarters. This map shows an earlier version of this alternative that should still be on the table. From the transit agency perspective, the Bays District (just east of Rozelle on the second map) offers value capture possibilities. No doubt under the right negotiated framework that is true, and it would not just be a giveaway to crony developers. However, I suspect the University of Sydney is also an entity that would contribute towards the construction of a station serving its main campus and which could provide a high speed service between the main campus and its new campus in Westmead. The good news is such a line is unlikely to be locked in before an election intervenes, so there is at least an opportunity to revise it over the next few years before serious money is committed and tunneling begins. Comments are open until May 18. Disclosure: The author works for the University of Sydney and could benefit if such a station were opened. However given the timeframes, and where the author actually works on campus, such a benefit is small, and probably less than the amount of time spent researching and writing this blog post. This is not necessarily the view of the University of Sydney, Transport for NSW, or anyone else.